Le Coucou is another French restaurant in a city that sometimes feels like it has a hundred of them, but it has two star qualities that make it stand out. One of them is its Michelin star. The other is the experience and pedigree of the men responsible for opening its doors. 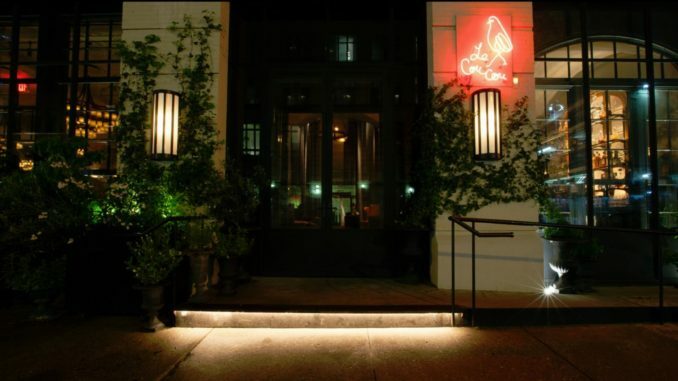 Le Coucou is the brainchild of Stephen Starr (also responsible for Morimoto and Buddakan) and Chicago-born head chef Daniel Rose. We’d normally have reservations about a French restaurant with an American heading up the kitchen, but Rose knows French flavors as well as anybody. He even ran the ‘Spring’ restaurant in Paris itself. Le Coucou is a classy establishment aimed at the high-brow diner. It’s a vast room with 86 seats, impressive vaulted ceilings and huge atmospheric candles everywhere, which threaten to turn the mood Gothic but just about avoid doing so. Despite the size, it’s possible to eat here as a couple and feel like you’re the only people in the room. That’s thanks to the banquettes that have been strategically employed to provide division between diners. Rose’s menu strategy – presumably agreed with Starr – is to build around French classics while adding in enough smaller modern quirks to please both ends of the audience. That’s why there’s both veal tongue crowned with caviar and eel fried in buckwheat available, and the wording around the foie gras dishes is almost apologetic. Nobody’s forcing anyone to eat foie gras though; with a menu as broad and deep as this, there’s no need to. With the average meat dish coming in below $50, this is sophisticated dining on a budget.